Day 11 is here and the Pipers weren't able to make an appearance either so I've smooshed a la Tim Holtz again but this time I've swapped the bold red, black and gold for delicate blue, white and silver. Now the photos just don't do this card justice - it was very tricky to photograph and I might try to get some better photos which I'll add later. In real life, the card has a real WOW factor and yet it's deceptively simple! 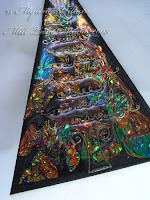 The base of the card is made of acetate and the front was run through the Cuttlebug and then I've painted the depressions of the pattern with white Pinata alcohol ink and Claro Extender - this is the hardest part of the card! Actually, it's not that hard really, just a little time consuming, but I think it's worth the effort. Unfortunately, the photo doesn't show the embossed texture, only the painted pattern. 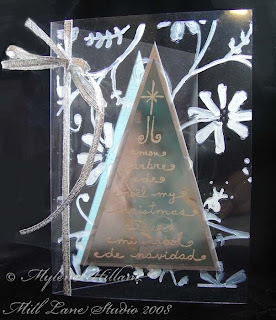 If you didn't want to try painting and embossing the acetate, you could try stamping an image with Opaque White StazOn to get a similar effect. 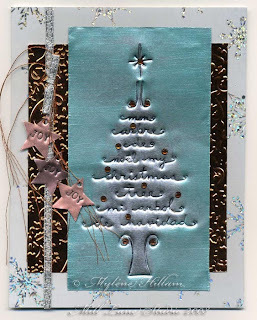 For the piece of smooshed card, I used Adirondack Stream, Espresso and Silver Mixative and then stamped the tree image in Brilliance Moonlight White, embossed with white embossing powder. I trimmed the card into a triangle shape and then cut away the pot from the tree. I've attached this piece to the front of the acetate and then attached a piece of silver shimmer paper behind the tree on the inside of the acetate. You need a space to write your message on the inside of the card so I've also attached a light blue triangle on the inside, lining it up with the front and then another piece on the outside back to hide the adhesive. A ribbon down the side adds a nice finishing touch. Such a simple card! 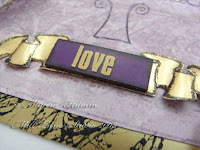 If you'd like to see more examples of my Painted Acetate technique, check out the latest issue of Cardmaking, Stamping and Papercraft (Vol 14 Issue 6) for some Valentine's samples. 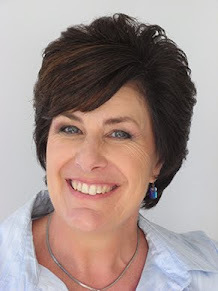 And finally, if you'd like a chance to win the blog candy posted on Day 8, then leave a comment on this post or any of the other posts in my Twelve Days of Christmas series. I'll be announcing the winner before Christmas. It's Day 10 of my Twelve Days of Christmas event but I was unable to book the "10 Lords a' Leaping" (it seems they are heavily booked at this time of the year!) so I hope you'll enjoy what I did with Tim Holtz' alcohol ink smooshing technique instead. This technique is so easy and is really fun to do. You begin by drawing squiggles of your chosen alcohol ink colours on a non-stick craft sheet, sprinkle a little Blending Solution around, lay down a piece of gloss cardstock on top and then turn it 90 degrees. Lift and admire the beautiful and totally unpredictable patterns (no two will ever be the same!). Add some more blending solution and place another sheet of cardstock on the craft sheet and you'll have a second, lighter version of the first background - great way to coordinate your cardstock! I used Red Pepper, Pitch Black and Gold Mixative. The Cuttlebug makes another appearance today - I just don't know how I ever managed without this nifty little machine before one found a home at my place! I've run a piece of gold gloss card through it with the Textile Texture embossing folder to frame the smooshed background. And just to prove what I said yesterday about how I usually use gold webbing spray on black gloss, I thought I'd include a layer of that as well! The label at the bottom is from Collections (as is the word vintage) but I didn't like the black label on the black background so I painted it with Lumiere Sunset Gold and added a piece of acetate behind it so that the word would pop out from the label. Today is Day 8 of the Challenge and it brings yet another new look. 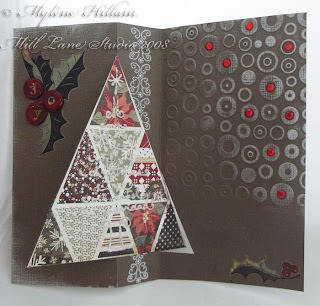 Using the same Basic Grey collection of papers and rubons, Ive created a swing card which works really well with a Christmas tree stamp. There is quite a bit of detail on this card so I've included a few extra photos for you to feast on. I started by stamping the image with Brilliance Moonlight White which I was planning to emboss but I wasn't quick enough and very little of the EP stuck so I touched it up with my trusty Uniball Signo White pen. The heart border around the tree comes in a roll and luckily, it's self adhesive so no glue is required - you just peel away the backing and place it where you want it. Great product! 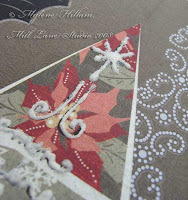 I've added a lacey white border rub-on down the spine of the card (this one is called Swirling Samba from Imaginisce) and attached a triangle of triangles cut from the Basic Grey paper. I also stamped the tree on the triangle paper and traced over it with Liquid Applique and Prisma Glitter before heating it with the heat gun to puff it up. 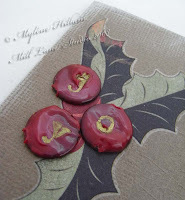 The holly berries spelling joy are Collections chipboard buttons dipped in Waratah Opals stamped with an alphabet stamp and Encore Gold ink. It takes a really long time for Encore to dry on Opals and you have to be careful not to smear it. Brilliance Graphite Gold dries faster but I prefer the colour of Encore Gold and so I just take care not to touch it. 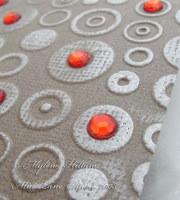 I Cuttlebugged the back flap of the card and swiped the embossed circles with Brilliance Moonlight White ink. And finally, I added a few red crystals for a bit of bling! 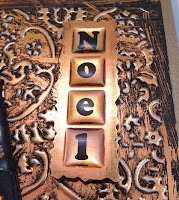 I used the Cuttlebug and holly embossing folder to create the background for this one. To get the beautiful shimmery colour on the leaves (which the camera hasn't picked up), I swiped them with a Versamark Watermark inkpad and then dusted on Polished Pigments. There are other mica powders you could use (Pearl Ex, Perfect Pearls, etc) - I just happened to have a couple of nice greens in the Polished Pigments so I used those. 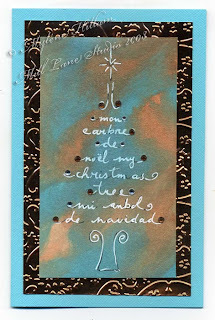 I stamped Mon Arbre with black StazOn ink and traced over the image with Uniball Signo white pen. In the two top corners, I punched some small holes through the 2 layers and pushed some knotted raffia through and then secured the ends to the back with tape. I didn't want to do the same thing on the other two bottom corners so to keep the acetate in place, I wrapped a length of crochet cotton around the bottom and sides. It ties in well with the raffia. I've run a small piece of gold mirror card through the Cuttlebug and then used an emery board to distress it just a little. You can see that better in the detail photo at the top of the post. 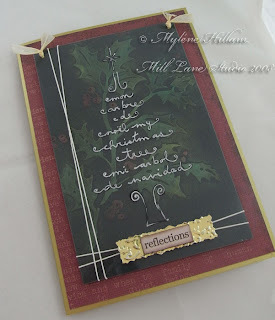 The word reflections is from Collections and the scrapbook paper is from Kaszazz. This is the closest I've come to traditional Christmas colours so far and although they're very muted, I quite like the effect. A subtle tartan or plaid paper would have worked quite well in place of the Kaszazz paper too and that brings to mind a Christmas song, Christmas in Killarney, from my all-time favourite Christmas Album: Bing Cosby's White Christmas. I have that CD playing in the background as I write this - I can assure you there's no better way to get into the Christmas mood than playing some Christmas music. 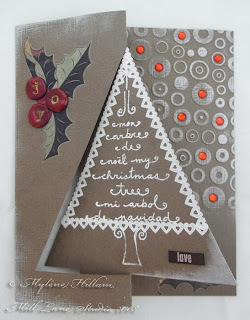 Today is Day 5 of my Twelve Days of Christmas event (aka twelve ways to use one stamp challenge) and the card today is called O Tannenbaum. The scan doesn't do this one justice so a description is in order. Looking at the photo, you might think that I've magically stamped the image on top of glitter but I can assure you that I haven't found a way to stamp directly onto glitter that leaves such a strong impression. 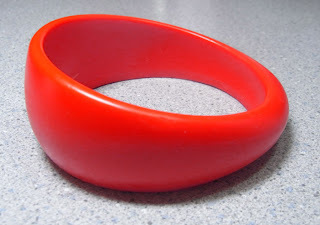 Besides, stamping on glitter is messy and leaves glitter sparkles all over your rubber. But what I did do is stamp the image with black StazOn ink on acetate which has been wrapped around the card and attached invisibly underneath the silver ribbon on the side. So that the image popped, I used very fine Prisma glitter and 2-way glue to create a tree directly onto the card stock underneath the acetate but you could cut the tree out of Jac Paper and sprinkle it with glitter and then apply that to the card as an alternative. I added a few snowflakes to the acetate - some are vellum stickers, some are punched from jac paper sprinkled with glitter and the others are punched from shim. 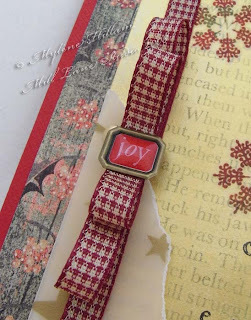 I also used shim for the label at the bottom of the tree (I just love that stuff!). When the card is standing, the acetate layer sits away from the card front and looks really cool with its silver peel-off border, the stamped image and the scattered snowflakes - they look like they're just floating in mid air! 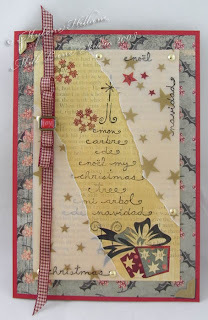 Day 4 of my Twelve Days of Christmas event brings a totally different look. 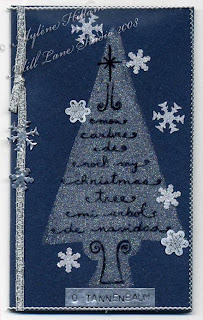 This card is entitled Patchwork Christmas Tree and it has more of a shabby chic feel about it. 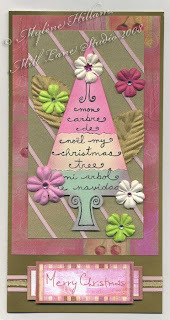 I've used up some offcuts to make this card - the lolly pink, pastel green and cream cardstock are all relics from my very early stamping days but they coordinate really well with some more recent purchases like the scrapbook paper from Scrapbooking Australia (Berry Cherry Christmas collection) and the Prima flowers. It's fun to be able to combine old stuff with new.... it gives it a totally new look! Once you reassemble the 3 different colours into one piece, tape them together on the back and then cut it into a tree shape. 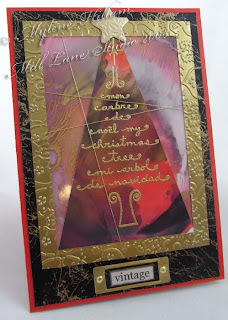 I sponged the edges of the tree with crimson ink and that softened the starkness of the coloured cardstock - it also helped to tie the elements of the card together. The stripes on the gold cardstock are lengths of pink satin ribbon attached with double sided tape and I added a few rhinestones to the flowers for some bling. When I look at this card, I keep thinking of the line "while visions of sugar plums danced in their heads" from the poem 'Twas the Night Before Christmas. It must be the cherries from the scrapbook paper, or maybe it's the softer colours or the pink strips - I'm not sure but it keeps reminding me of that poem..... what do you think? It's the second day of my Twelve Days of Christmas period and sadly, I have no Turtle Doves to offer. But instead, I have this card which I've called Joy, Joy, Joy. 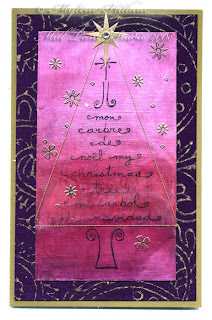 Once again it features Magenta's My Christmas Tree / Mon Arbre and it is again using turqouise and copper. But this time, I've also added white and silver. 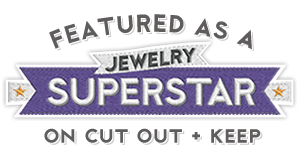 The image is stamped onto silver metal shim. You could use a silver pie plate or a Milo tin seal for this technique and it would look equally as good. 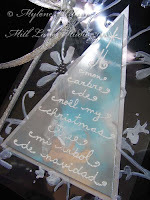 After tracing the stamped image with a metal stylus, I painted the shim with 2 very light coats of Pearlescent Turquoise Lumiere paint, leaving the silver of the tree to show through. That really helps to draw your eye to the main image. The hanging stars are cut from copper-coloured shim which I've stamped with a metal alphabet set and they're attached with copper embroidery floss to the silver lurex ribbon running up the side of the card. 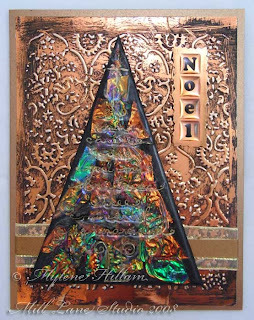 I attached Christmas wrapping paper to the card front and the layer in the middle is once again Cuttlebugged copper mirror board. And finally, I added a few brown crystals to the tree to tie it all together. Check back tomorrow to see what I come up with for Day 3. Don't you love that Christmas Carol? You know the one, The Twelve Days of Christmas! I never really understood what the meaning behind it was until recently. The 12 days of Christmas is actually the period beginning on the eve of Christmas Day and ending on the morning of Epiphany (the 6th January). So I thought I'd share with you a card a day (or thereabouts) for twelve days in the lead up to Christmas. After all, it's not very sensible sharing them with you on the 12 days after Christmas! 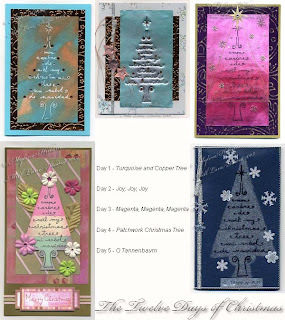 These cards are all made with Magenta's "My Christmas Tree / Mon Arbre" (41.007.N) so this will also be "Twelve ways to use one stamp"! Magenta stamps are now being distributed in Australia by Craft-A-Lot. And here's the first one - Turquoise and Copper Tree. 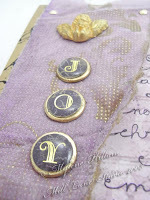 The background is painted with Radiant Pearls and stamped with StazOn Jet Black ink. I traced over the stamped image with a white Signo Uni Ball pen and added some brown crystals to the tree tips. 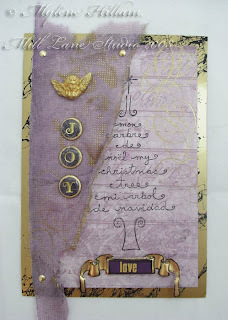 The background is Cuttlebugged copper mirror board which was layered on Doodlebug card. 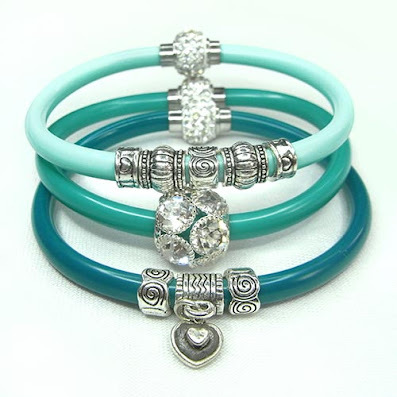 The colour is Swimming Pool....... hmmm love that name - so apt for Christmas in Australia!